0 to 12 B 1 inch|25 mm diameter impeller with precision axle and low-friction Zytel® bearings. Startup speed stated as lower limit, readings may be taken down to 0.4 m/s | 79 ft/min | 1.5 km/h | .9 mph | .8 kt after impeller startup. Off-axis accuracy -1% @ 5Âº off-axis; -2% @ 10Âº; -3% @ 15Âº. Calibration drift < 1% after 100 hours use at 16 MPH | 7 m/s. Replacement impeller (NK PN-0801) field installs without tools (US Patent 5,783,753). Wind speed calibration and testing should be done with triangle on impeller located at the top front face of the Kestrel. -10.0 to 55.0 °C Hermetically-sealed, precision thermistor mounted externally and thermally isolated (US Patent 5,939,645) for rapid response. Airflow of 2.2 mph|1 m/s or greater provides fastest response and reduction of insolation effect. Calibration drift negligible. Thermistor may also be used to measure temperature of water or snow by submerging thermistor portion into material -- remove impeller prior to taking submerged measurements and ensure humidity sensor membrane is free of liquid water prior to taking humidity based measurements after submersion. -10.0 to 55.0 °C Temperature inside 1in|25 mm black powder coated copper globe converted to Tg equivalent for standard 6 in|150 mm globe. Closest equivalence obtained with airflow greater than 2.2 mph|1 m/s. non-condensing 0 to 100% Polymer capacitive humidity sensor mounted in thin-walled chamber external to case for rapid, accurate response (US Patent 6,257,074). To achieve stated accuracy, unit must be permitted to equilibrate to external temperature when exposed to large, rapid temperature changes and be kept out of direct sunlight. Calibration drift +/- 2% over 24 months. Humidity sensor may be recalibrated at factory or in field using Kestrel Humidity Calibration Kit (NK PN-0802). 1/16th Cardinal Scale 0 to 360° 0 to 360° 2-axis solid-state magnetoresistive sensor mounted perpendicular to unit plane. Accuracy of sensor dependent upon unit's vertical position. Self-calibration routine eliminates magnetic error from batteries or unit and must be run after every full power-down (battery removal or change). Readout indicates direction to which the back of the unit is pointed when held in a vertical orientation. Declination/variation adjustable for True North readout. User Input (Duct Shape & Size) Volume of air flowing through an opening. Automatically calculated from Air Velocity measurement and user-specified duct shape (circle or rectangle) and dimensions (units: in, ft, cm or m). Maximum duct dimension input: 258.0 in | 21.5 ft | 655.3 cm | 6.55 m.
User Input (Reference Pressure) Height above Mean Sea Level ("MSL"). 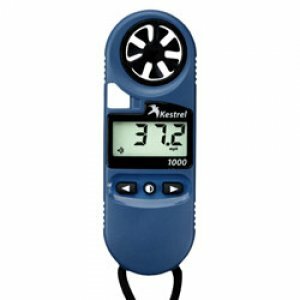 Temperature compensated pressure (barometric) altimeter requires accurate reference barometric pressure to produce maximum absolute accuracy. Both accuracy specs corresponds to a reference pressure anywhere from 850 to 1100 mBar. User Input (Reference Altitude) Air pressure that would be present in identical conditions at MSL. Station pressure compensated for local elevation provided by reference altitude. Requires accurate reference altitude to produce maximum absolute accuracy. Compass Effective wind relative to a target or travel direction. Auto-switching headwind/tailwind indication. Pressure Local air density converted to equivalent elevation above sea level in a uniform layer consisting of the International Standard Atmosphere. Relative Humidity Temperature that a volume of air must be cooled to at constant pressure for the water vapor present to condense into dew and form on a solid surface. Can also be considered to be the water-to-air saturation temperature. User Input (Concrete Temperature) The rate at which moisture is lost from the surface of curing concrete. Requires user measurement and entry of concrete temperature obtained with an accurate IR or probe thermometer (°F or °C, not included). Readings should be taken 20 inches above pour surface with the thermistor shaded, and averaged for 6-10 seconds using built-in averaging function. Relative Humidity Perceived temperature resulting from the combined effect of temperature and relative humidity. Calculated based on NWS Heat Index (HI) tables. Measurement range limited by extent of published tables. Pressure Mass of water vapor in a mass of air. Pressure The ratio, expressed as a percentage, of measured air density to the air density of a standard atmosphere as defined by the ICAO. Pressure Estimated safe maximum continuously sustainable human metabolic rate (W/m2) for the conditions and clothing factors. Based off of estimated metabolic output of typical human. On-screen zone warnings. Pressure Measure of human heat stress defined as the combination of effects due to radiation, convection, and conduction. Outdoor WBGT is calculated from a weighted sum of natural wet bulb (Tnwb), globe temperature (Tg), and dry bulb temperature (Td). User settable on-screen warning zones. Pressure Similar to psychrometric wet-bulb temperature (see below). However, Tnwb only undergoes forced convection from the ambient air velocity. Tnwb is a measure of the evaporative cooling that the air will allow. This is accounted for by combining the effects of, mainly, relative humidity and windspeed. Temperature Perceived temperature resulting from combined effect of wind speed and temperature. Calculated based on the NWS Wind Chill Temperature (WCT) Index, revised 2001, with wind speed adjusted by a factor of 1.5 to yield equivalent results to wind speed measured at 10 m above ground. Measurement range limited by extent of published tables. Display & Backlight • • • Reflective 3 1/2 digit LCD. Digit height 0.36 in / 9 mm. Aviation green electroluminescent backlight. Manual activation with auto-off. • • • • • • • Multifunction, multi-digit monochrome dot-matrix display. Choice of aviation green or visible red (NV models only) electroluminescent backlight. Automatic or manual activation. & Display Update • • • • • • • • • • • • • All measurements except those based on relative humidity respond accurately within 1 second. Relative humidity and all measurements which include RH in their calculation may require as long as 1 minute to fully equilibrate to a large change in the measurement environment. Display updates every 1 second. • • • • • • • Max and average wind calculation may be started and stopped independently of data logging of other values, along with all other wind-related functions: air velocity, crosswind, headwind/tailwind, wind chill, WBGT, TWL, evaporation rate. points Minimum, maximum, average and logged history stored and displayed for every measured value. Large capacity data logger with graphical display. Manual and auto data storage. Min/Max/Avg history may be reset independently. Auto-store interval settable from 2 seconds to 12 hours, overwrite on or off. Logs even when display off except for 2 and 5 second intervals (code version 4.18 and later). Data capacity shown. Data Upload & Bluetooth® Data Connect Option • • • • • • • Requires optional PC interface (USB or RS-232) or Bluetooth data transfer option and provided software. • • • • • • • Real-time hours:minutes:seconds clock, calendar, automatic leap-year adjustment. • • • • • • • User-selectable -- 15 or 60 minutes with no key presses or disabled. Languages • • • • • • • English, French, German, Italian, Spanish. Certifications • • • • • • • • • • • • • CE certified, RoHS and WEEE compliant. Individually tested to NIST-traceable standards (written certificate of tests available at additional charge). Origin • • • • • • • • • • • • • Designed and manufactured in the USA from US and imported components. Complies with Regional Value Content and Tariff Code Transformation requirements for NAFTA Preference Criterion B. • • • • • • • Standard Models: AAA Alkaline, two, included. Average life, 400 hours of use, reduced by backlight or Bluetooth radio transmission use. Tactical Models: AAA Lithium, two, included. Average life, 400 hours of use, reduced by backlight or Bluetooth radio transmission use. Shock Resistance • • • • • • • • • • • • • MIL-STD-810g, Transit Shock, Method 516.5 Procedure IV; unit only; impact may damage replaceable impeller. Sealing • • • • • • • • • • • • • Waterproof (IP67 and NEMA-6). Operational Temperature Limits • • • • • • • • • • • • • 14° F to 131° F | -10 °C to 55 °C Measurements may be taken beyond the limits of the operational temperature range of the display and batteries by maintaining the unit within the operational range and exposing it to the more extreme environment for the minimum time necessary to take reading. • • • • • • 5.0 x 1.8 x 1.1 in / 12.7 x 4.5 x 2.8 cm, 3.6 oz / 102 g.
• 6.5 x 2.3 x 1.1 in / 16.5 x 5.9 x 2.8 cm, 4.4 oz / 125 g.
* NOTE: Accuracy calculated as uncertainty of the measurement derived from statistical analysis considering the comined effects from primary sensor specifications, circuit conversions, and all other sources of error using a coverage factor of k=2, or two standard deviations (2Σ). Please note, these specifications are valid for all Kestrel 4400 products and all other Kestrel 4000 series with a serial number higher than 659340. If your product has a lower serial number, please reference the previous version of the specifications.